PETALING JAYA: The residential property market, especially landed residences, is on a recovery mode and prices of houses in some parts of Kuala Lumpur and Petaling Jaya have rebounded by 15% to 25% in the past one year, property realtors and consultants said. However, the high-rise condominium and office market is still facing an oversupply situation and will weigh down on the market at least over the next couple of months. CB Richard Ellis Sdn Bhd executive director Paul Khong said Malaysians still had money to invest and residential was the hot favourite at the moment. “Landed properties have rebounded in all segments across the board while in the strata segment, the high-end ones in KLCC and Mont’Kiara have moved relatively slower due to the current supply situation and the small tenancy market,” Khong added. According to Knight Frank Ooi & Zaharin Sdn Bhd managing director Eric Ooi, the landed residential property market has fared well as it is considered a good time to buy now. “The market has certainly picked up due mainly to limited supply, the high liquidity in the system, and growing interest in property as a reliable investment instrument,” Ooi said. The affordable entry cost and an all-time low bank interest rates have also contributed to the improved sentiment and rising house prices. Ooi said landed residential property prices in some parts of Kuala Lumpur, such as Desa Parkcity, had breached new high and house prices in well-sought-after locations would continue to strengthen. “I believe even the commercial sector has seen the worse and although the market is still soft, it is stabilising. If the economy continues to grow steadily, the commercial sector will be next to rebound,” Ooi added. Ooi said that besides the good location, the unique concepts and exclusive features of some of the projects were the reasons for the strong demand and prices. DTZ Nawawi Tie Leung Sdn Bhd executive director Brian Koh concurred that supply of landed housing property had not caught up with demand as there was a lag in new supply coming onstream after developers held back their project launches in the past two years. “The performance is still very location centric and concept driven. Buyers prefer well-established neighbourhoods and those with good concepts. Security has become a top priority and that’s why gated and guarded projects are doing very well,” Koh said. He said even some KLCC condominiums were attracting interest again. Koh said there was a need to monitor the impact of potential rise in interest rates on property demand especially in the medium to lower price range. “The higher entry cost may affect demand going forward but it could have contributed to buyers locking in at the current low entry cost,” he added. Perdana Parkcity Sdn Bhd director of marketing and sales Susan Tan said a combination of factors including a pent up in demand and limited supply were the main causes of the current price rebound in the residential market. 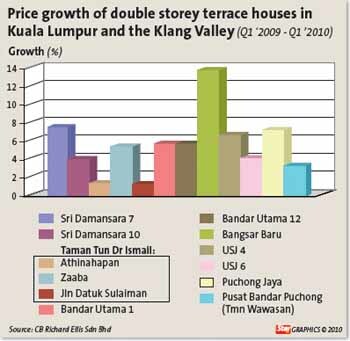 “There has been no new supply of landed housing in Kuala Lumpur in the past year. A fear that prices will climb further due to an expected rise in the cost of construction is also fuelling demand now. “Buyers are willing to pay for the right address, a good overall concept and well landscaped and maintained environment. That’s why some highly sought after projects can fetch quite high price premiums,” Tan said. Perdana ParkCity is the developer of the 473-acre Desa ParkCity in Kuala Lumpur which has fetched one of the highest premiums in terms of landed property prices in the capital city. Sunway Real Estate Investment Trust (Sunway REIT) fell on its Malaysian market debut after raising about RM1.5 billion in Southeast Asia’s biggest initial public offering this year. Sunway REIT’s units were trading at 89 sen each at 9.14 am local time, below its opening reference price of 90 sen. Meanwhile, Jeffery Cheah, chairman of its parent company Sunway Holdings Bhd said the REIT aims to double its asset size in five to seven years. “The whole purpose is to grow it,” Cheah told reporters in Kuala Lumpur today.